This is a project of The Women Bloggers and Kendal King Group on behalf of Gerber, but my love for their products is all my own! I did it. 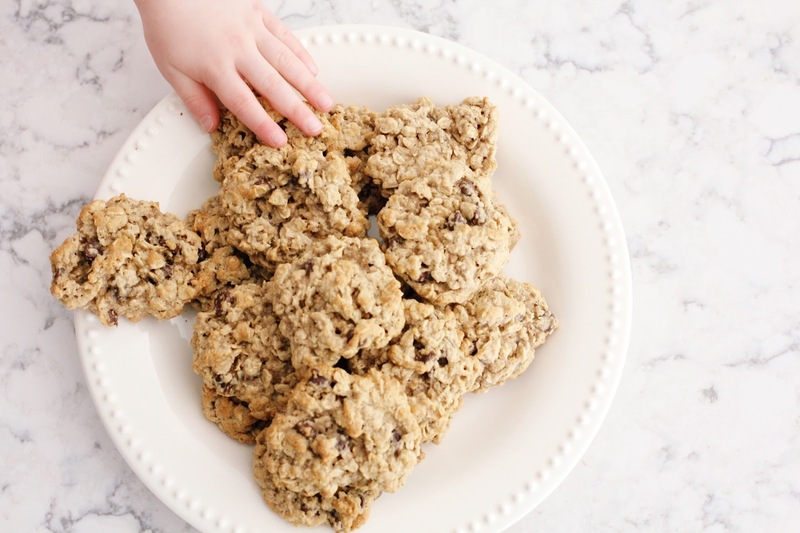 I finally managed to create a somewhat healthy cookie that the whole family loves! These cookies are soft, sweet, and packed with some good stuff. I certainly don’t mind letting my kids have one…or two…or three! Want to know my secret ingredient? I know….that’s not healthy….but I’m a fun mom, so I had to do it, right? I only used a small amount and they really give the cookies the extra kick to take them over the top. So, it was worth it. My other secret ingredient? Gerber Oatmeal Cereal. Yep, you read that right! I put some baby cereal in these cookies and NOBODY noticed. I gave one cookie to Sadie (her first ever!) and she was all about it. Look at that face! I wish you could see the rapid bouncing up and down that followed. This girl was in heaven. And Wrigley was pretty happy to clean up the mess for me. 8. Cool 1 minute then remove to wire rack to cool completely. 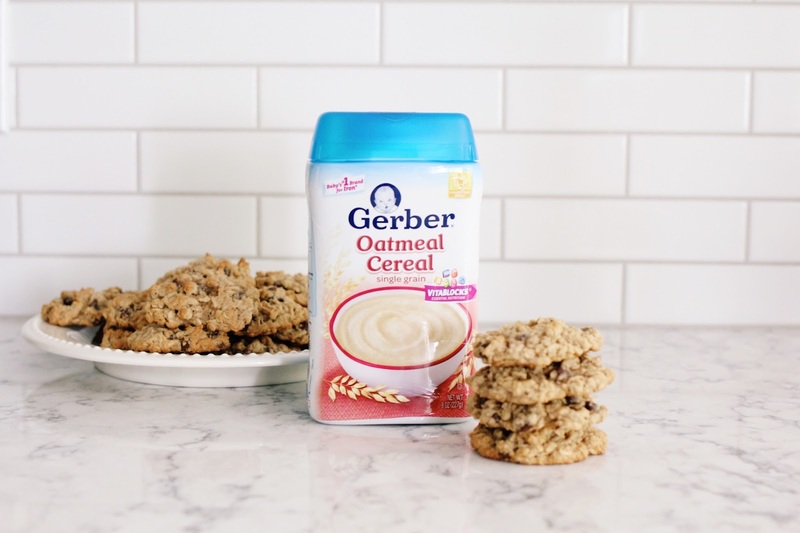 After my husband ate a cookie I told him there was Gerber Oatmeal Cereal in it and he didn’t believe me! It’s totally not just for babies! I simply shaped out some of the flour for the cereal. It’s iron-fortified, which is a key to healthy growth and development. Plus Gerber Oatmeal Cereal packs in vitamins B, E, C, zinc, and calcium. So I feel good about feeding it to my baby…and my whole family! 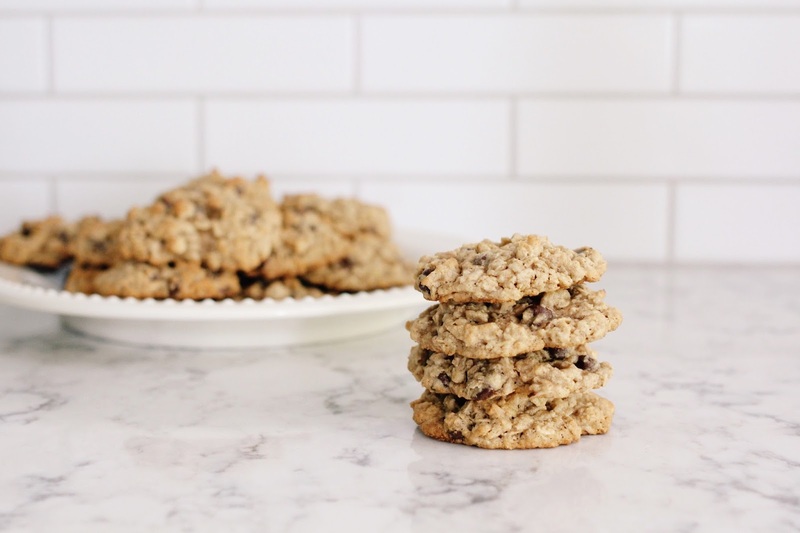 Want to win a $50 pre-paid credit card to make your own delicious oatmeal cookies? Or go shopping, you choose. Enter below! Open to U.S. residents only. Giveaway ends 5/31/16. 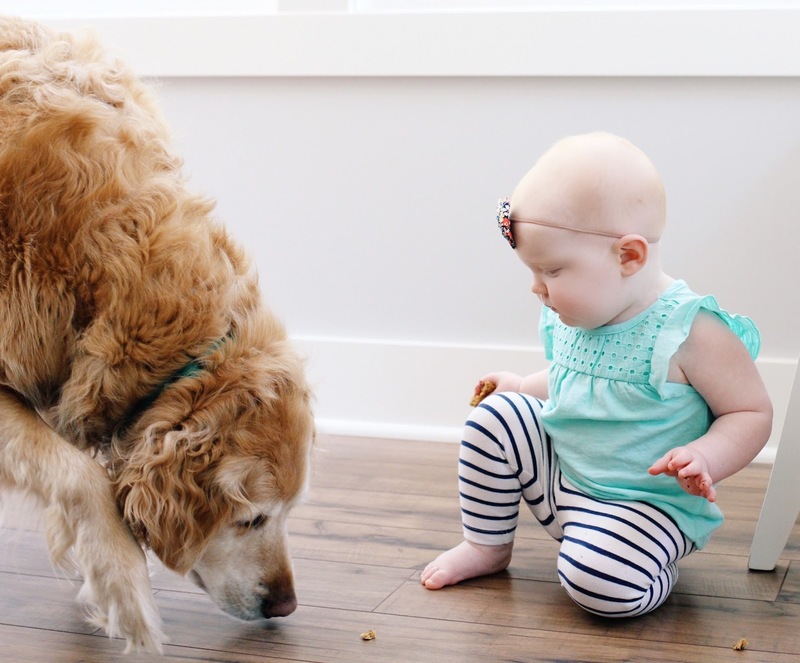 I’ve always turned to Gerber for products that help my kids get the best possible start. You can find Gerber products at Walmart. 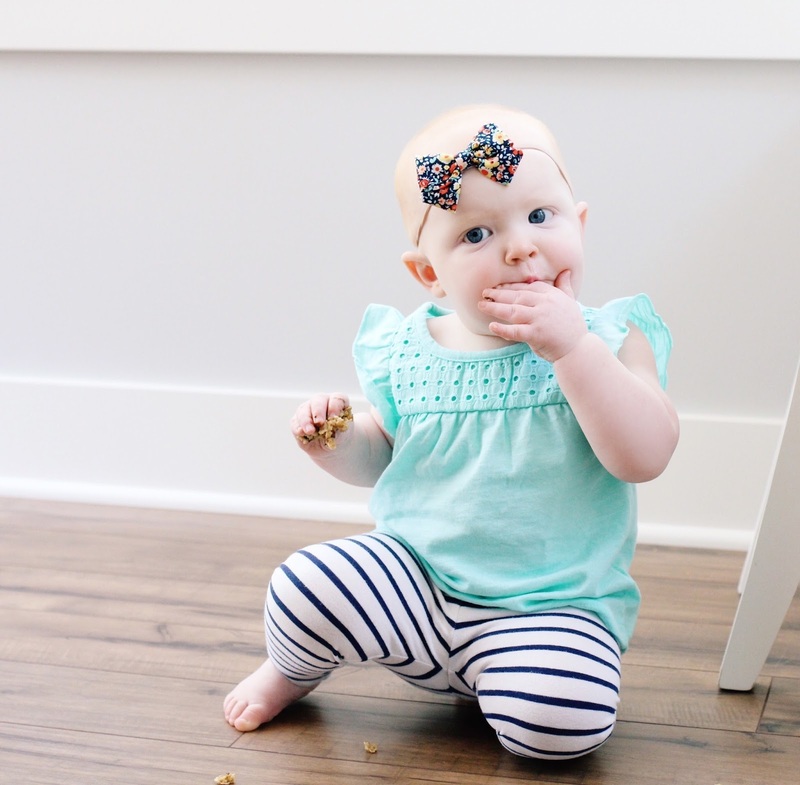 We love chocolate chip oatmeal cookies! And how creative to put baby oatmeal in them! Thank you for posting!! I'm in need of something my picky toddler will eat. And he loves cookies. Maybe I can get him to eat these! Can't wait to try. We love cooking as a family on the weekends. Currently gaucamole has been a favorite! My fmaily enjoys making yogurt pops together. We also decorate cookies and cupcakes. They love to be in the kitchen with us. we like a banana cream pie–1 graham cracker crust (store bought), put banana slices on the bottom, make instant banana pudding & pour into the pie shell, garnish with Redi Whip–delicious! We like to bake chocolate chip cookies together. I love to make smoothies. My 6-yr old son and I create some really cool flavors and mixes using a variety of fresh ingredients. Something we both enjoy eating, and making! I love making carrot cake! We like baking brownies and cupcakes together. Thanks for the chance to win! Who'd have thunk it?? Such a great idea! We love to make chocolate chip cookies together. We love making big Cinnamon rolls together with my daughter! I would love to find a good recipe to help get more fruits and veggies to my toddler who is being really picky lately! 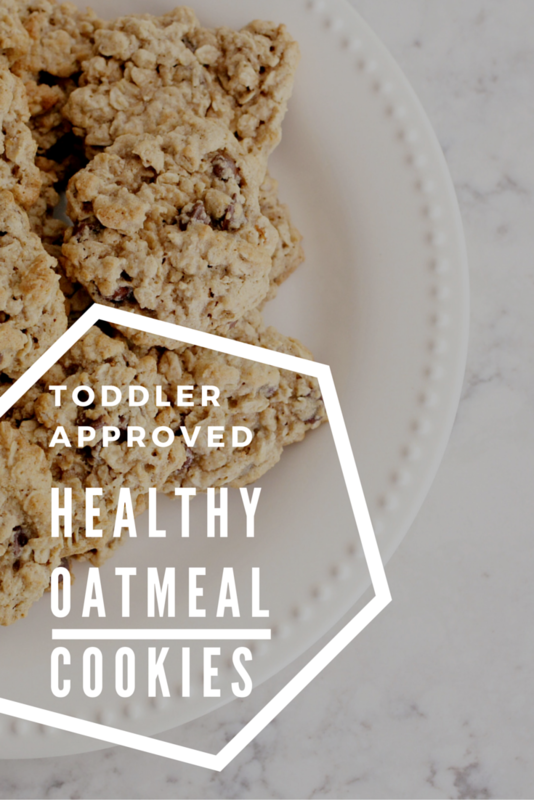 Oh we love oatmeal cookies! 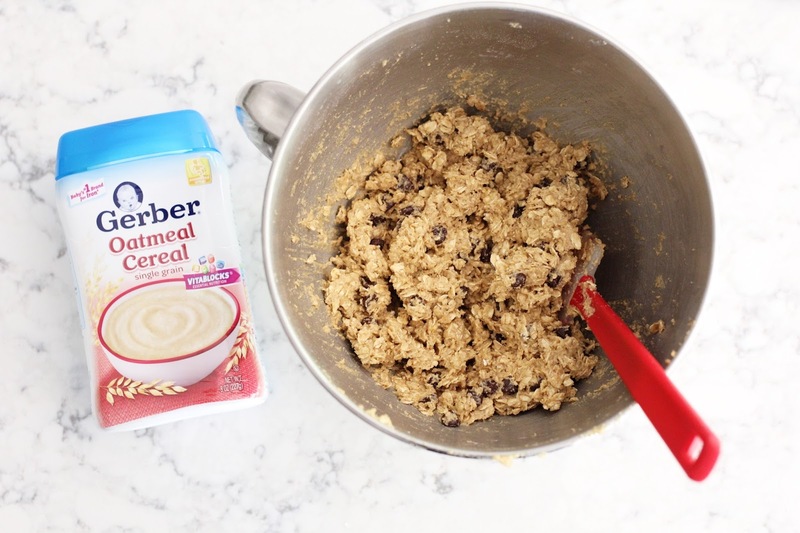 I cannot wait to try this healthier version! Look delicous! We love to make chocolate chip cookies! Em Mahr – We love to make whole grain blueberry muffins! When my son was little, we loved making brownies together. He loved mixing and licking the bowl! I enjoy making zucchini bread with the help of my daughter. Ive been on an oat kick and have both quick oats and old fashioned lol. 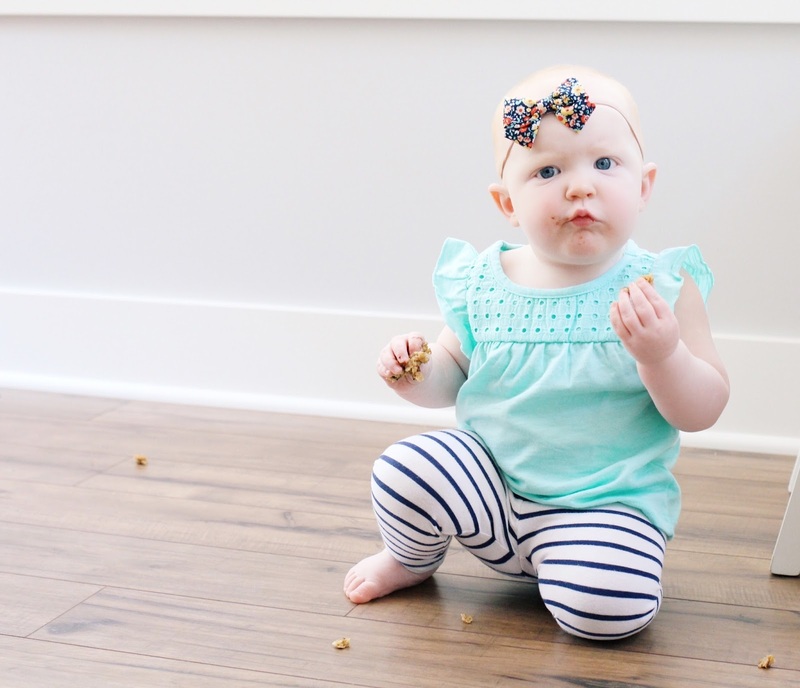 For the sake of skipping a step, do you think the baby cereal is absolutely necessary? I'm not much of a baker these days but I love to make shepherd's pie for my husband! I love making breakfast for my gang pancakes, eggs, muffins fresh squeezed orange juice! We love making sugar cookies together, cutting them out, then icing them and decorating them.